MAID OF BAIKAL answers this question: What if a Siberian Joan of Arc had rescued the White Armies at a critical point of the Russian Civil War in 1919? The novel offers an alternative outcome to that war through the intervention of Zhanna Dorokhina, a young woman from the shores of Siberia’s Lake Baikal. What will this alternative history of the 1919 Russian Civil war bring to bear? To explore a different view on the past, I’ve been joined by a favourite here at ItsWriteNow.com, Preston Fleming. Preston, what’s been going on in your personal world of writing? I’ve spent the last three years completing my sixth novel, MAID OF BAIKAL: A NOVEL OF THE RUSSIAN CIVIL WAR. Wow, three years is a substantial chunk of time. Where have the greatest changes been over this time? I’ve enjoyed experimenting with a new fiction genre: alternative history. MAID OF BAIKAL tells the story of the Russian Civil War but changes the war’s outcome. Do you feel that the voice that you are crafting through your work has progressed as you have continued to experiment with this new fiction genre? What are changes the greatest changes that you feel that you’ve seen with your work? I have improved my craft with the help of a highly skilled professional editor. Let’s take a tour of this craft by exploring The Maid of Baikal. How did this work come to life? I grew up in Cleveland, Ohio, where I knew many families that fled Soviet tyranny. I always considered it tragic that the Red Army won the Russian Civil War but knew that the White Armies weren’t angels, either. For many years, I asked myself: If the White Armies had won, how could they have done it? And my answer was that they would have had to deserve the victory. And that’s how I came up with the idea of a Siberian Joan of Arc who helped make them worthy of winning. Were your experiences of Soviet life gained from your interactions with those families in Ohio, or have you been lucky enough to have seen this region of the world in person? I have spent some time in Siberia and drew on my experience there to convey a sense of that great land. What was the central sense, or idea that you wanted to share about this great land with the readers? I wanted to show how a great leader can make a difference for good on the world stage. Creating a great fictional leader can be a complex challenge. What steps did you take to make sure your leader and supporting characters rang true? The story follows closely the story of the historical Joan of Arc in 1429 but superimposes that story over the actual history of the Russian Civil War. Most of the characters are actual historical personages. It sounds like it would be easier to write characters who are actually people from the past, but I’m sure there’s still a huge number of things you would need to learn about the people and history along the way. What did you learn a lot about while writing bringing these characters to life? I learned about putting myself inside the character of a 19-year-old young woman in Russia was a fascinating challenge. That is a fantastic challenge. It would certainly keep you busy for quite a while! Do you find that tackling writing challenges, like this one gives you energy, or is the prospect of these challenges more exhausting and overwhelming? Nearly always it energizes me. What’s at the top of your mind when you’re writing and full of energy? I have my Beta Readers in mind. If you want to know about my writer’s education or whether I belong to a writer’s group, I have avoided literary groups. My education as a writer took place primarily in boarding school. In college, I majored in psychology and took a variety of liberal arts courses. After that, I took professional degrees in business and law and practiced in those fields. I also spent 11 years in the U.S. Foreign Service, mainly in the Middle East. I believe that having a broad range of life experiences makes for writing that readers will find interesting. I completely agree I think that a broad range of experiences helps you develop writing that is more interesting for readers. Have you tried to tie these experiences, and in turn published works together to form a single author brand? I have done my best to develop the Preston Fleming brand despite the fact that I don’t always write in the same genre. I have written two spy thrillers, three future political dystopian thrillers, and one alternative historical novel. I agree that does seem like an eclectic mix, but I’m sure you can still tie all of these works together. Maybe you can use your next work to do just that. After two spy thrillers, three future political dystopian thrillers, and one alternative historical novel, what’s the next area of fiction that you want to experiment with? I am working on a contemporary thriller that addresses a controversial issue. A taste of contemporary thrills, that will mix nicely. Well, I best let you get back to the thrills so that your eager readers have less time to wait for your next release. Preston, thanks for chatting with me today, and I hope you continue to enjoy bringing Maid of Baikal to readers worldwide! Excited to read the book we discussed today? Find it here on Amazon: ‘Maid of Baikal: A Novel of the Russian Civil War ( ASIN: B075RRR682 )‘. 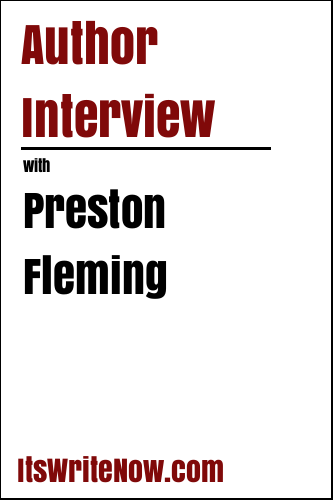 Want to find out more about Preston Fleming? Connect here!